80mph speed limit will hit fuel bills | What Car? A new 80mph limit on motorways would hit fuel consumption and increase running costs, a What Car? study has revealed. These were the results of a What Car? study, after doing steady-speed tests at both 70mph and 80mph with a diesel-powered Ford Focus. These findings go against the proposal announced by the then Transport Secretary Philip Hammond in September, when he said raising the speed limit would generate economic benefits, worth hundreds of millions of pounds per year from savings of travel time. At 70mph, our Focus 1.6 TDCi 115 5dr averaged 51.5mpg with our test equipment and two people on board. However, at 80mph the car could manage only 42.8mpg. Lower mpg figures mean higher costs for motorists. Assuming the price of diesel is 140.3p a litre, a mile would cost around 12p with our test car, but nearly 15p at 80mph. Thats more than 300 every 12,000 miles. It would also lead to more frequent fuel stops; the 53-litre tank on our Focus means it can do 600 miles at 70mph, but loses about 100 miles of its range at 80mph. Drivers would save time going at higher speeds, but only around 10 minutes every 100 miles if the route were clear of traffic. 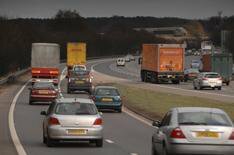 Formal proposals to increase the speed limit for cars and motorcycles on most stretches of motorway in England and Wales are due to be put forward for public consultation this year, with a view to implement any changes in early 2013. Here's how increasing the motorway speed limit from 70mph to 80mph could hit your average economy and CO2 emissions. Why the Government wants to increase speed limit to 80mph.